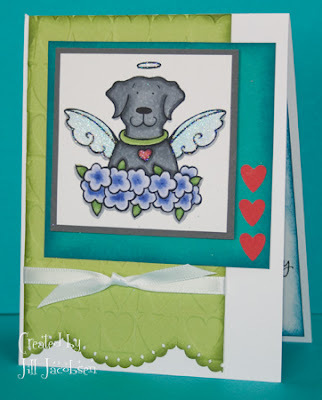 Just a quick post to share another Michelle Perkette digital stamp card. She has a pet sympathy set and low and behold I needed one. A friend just had to put her dog down and has taken it extremely hard...I feel for her. I colored with Copics and then used the Penboss and Sparkle EP on the wings, heart and halo. I forgot to take a picture of the inside, but one of the sentiment in the set is Until you meet again at the Rainbow Bridge.....and I used my Zendoodle Rainbow above it and used Sparkle EP on it too. I think it came out nice and hope she is encouraged by the card. Help! I make cards for my daughter who is a groomer, and a rescue group for dogs. I like this card and would like the set. I could not find it, can you send me the link? A sweet card and wonderful layout! Great job! This is really lovely. I love green & teal together and the red hearts are a great accent. Is this one of the stamps coming soon? I didn't see it on the website - or did I miss it? It's a very sweet image. OOPS - totally egg on my face! I scrolled right past your link. And with soo many great digitals; I missed it when I looked for it on the website! Thanks for the link (sorry I missed it the first time lol! )- really sweet set - just might need this one for all my animal friends!